UPDATED: MAR 10, 2019 Surpised to see this is out of production. Tried it recently on tap in Quebec. Not quite as fresh or tasty as the ephemere apple, but its very tasty. Mild and fruity. Effervescent. Drought at International Great Beer Expo (Meadowlands). Hazy yellow with white foamy small head, fruity aroma, high carbonation, sweet fruity taste, longish finish. Strange discrepancy between the aroma and taste. Did not enjoy it very much. 750mL Bottle in Montreal. Pours a light hazy yellow colour, fairly thick white foam. Aroma and taste is sweet, apricots and peaches. Great belgian character as well, presence of yeast, wheat, coriander, mild clove. Delicieux. Originally rated in 2007. Man, I have not seen this one for many years. I use to buy it all the time. I think they made it for fall season. 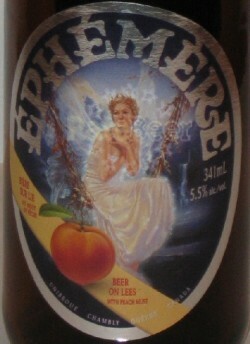 It also came in a tester pack with all the other Ephemère brews. Had a great peach nose and taste. Was cloudy and light orange colour with a white head. I wish they would bring this one back. Overly sweet, overly carbonated, overly artificial. Not a good combination for me. Three hours later, and I’m still burping fake peach syrup. Bottle shared with HogTownHarry. Pours a very cloudy yellow with an average size diminishing white head. Aroma of unsweetened peaches, yeast, some sugar and spices. Flavour follows the aroma and is quite mild and watery -- it’s a little dissapointing. Light bodied. It’s enjoyable enough but nothing I’d go out of my way to get again. Bottle (750ml). Shared with blankboy, his bottle. Poured very cloudy light orange-yellow with a diminishing white head. Aroma of cling peaches, pears, apple juice, yeast and a hint of Blanche de Chambly. Taste is pretty bland - lightly of peach, it diminishes quickly. Mouthfeel is lightly acidic, watery and flat - smells nice, not much flavour. Un arome de pèche légé, sa saveur de fruit est plus présante que Pomme et Framboise, mais mois que Camberge. Une assé bonne bière de fruit.